The first documentation of a settlement along the Adige River dates back to the 6th century. As life in medieval times became more complicated, by the 11th century people needed the protection of some sort of fortification. 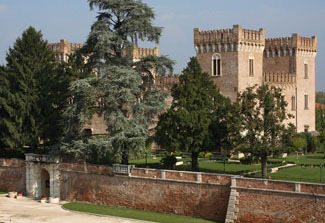 In 1336, in order to fend off attacks by the neighboring Carraresi, the Scaligeri lords of Verona gave consent for Count Guglielmo Bevilacqua to build the Castello di Bevilacqua. The work was completed by his son Francesco, who, because of his political acumen, received honors from Pope Clement VI. At that time in Bevilacqua’s history a wide moat and three rings of fortified walls surrounded the castle. Centuries of constant warfare caused considerable damage, and by the time the Venetian Republic finally seized it, the castle no longer served any defensive purpose. In 1532 Gianfrancesco Bevilacqua commissioned the famed architect Michele Sanmicheli to turn the medieval structure into a comfortable country home. The castle was again restored and modernized in 1756. During the Napoleonic Wars in the early 19th century, the castle was once again damaged. Austrian troops set it on fire in 1848. Baroness Felicita La Masa Bevilacqua began a slow renovation in 1860, giving it a neo-Gothic appearance that was fashionable for the times. The family turned the castle over to the state in 1932 for use as a nursing home. The Germans occupied it as a command post during World War II, and after the war the castle served as a boarding school. The Cerato family bought what was then an abandoned property in 1990 and began a complete restoration, bringing its magnificent 16th-century interiors back to life. The authentic antique beds at Bevilacqua are beautiful works of art; however, if you’re a professional basketball player, you might find them a little on the short side. For everybody else, they’re just fine! Rates include tax, service, and breakfast. Bevilacqua is about 45 km southeast of Verona. From SS434, continue east on SP44. From Padova (Padua), it’s about 57 km. Take A13 south and continue west on SR10. The castle is in the village off the main road. You can also get to Bevilacqua by train from Verona or Padova. An irresistible combination of history and romance awaits you at this atmospheric castle hotel in the Veneto countryside. If you need to take a few days off from the sightseeing circuit of Verona, Padova, and Venice, you’ve come to the right place. Marked by four crenellated corner towers and a central courtyard, the castle boasts both medieval and neo-Gothic elements. Throughout you'll find vaulted, arched or heavy wood-beamed ceilings, fine antiques, and salons that have the feel of being in a country estate. Even though there are only seven junior suites, the castle can have lots of activity going on, whether it’s a wedding, meetings, or a mystery dinner. Located in the towers, each completely different suite is named for a personage who played a part in the castle’s history. Highlighting each is a restored antique bed, and just try to choose among them! My pick would have to be the four-poster canopy bed in the Francesco II suite. If you like gorgeous frescoes on the walls, go for the Generale La Masa, Gaetano II, or Francesco II suites. Bathrooms are completely modernized, yet are in keeping with the castle theme. All have Jacuzzi bathtubs, with the exception of the Duchessa suite, which features a free-standing, cast iron tub. For romantic and intimate dining, step into the All’Antica Ala restaurant. The chef offers typical seasonal cuisine of the region or perhaps something special not on the menu. The wine is superb. Reservations required. If there are at least four of you, wine tasting can be arranged. The staff at Bevilacqua cannot be friendlier or more helpful. Don’t hesitate t0 ask for suggestions of how best to enjoy the area.